April 26, 2017 By Kim F Leave a Comment This post may contain affiliate links. Read my disclosure policy here. You’ve already seen the best Disneyland attractions for babies and toddlers here and today we are going to talk about Disney California Adventure! The Disneyland Resort is a great vacation spot for families and the best place to book that vacation is through Get Away Today because they are pure Disneyland experts. They have the lowest price, guaranteed, and with promo code MothersNiche you can get an additional $10 off any Southern California vacation package. Disneyland has plenty of attractions for babies and toddlers, but what about Disney California Adventure? I’ve compiled a list of attractions that are suitable for your little ones to enjoy with the rest of the family. While Buena Vista Street may not have any rides to jump on while visiting, you can cruise around Buena Vista Street and Hollywood Land on the vintage Red Car Trolley. Your kids will love seeing all the fun buildings and if you are lucky you might even see a character or two walking around! If your little ones love the movie “UP,” this spot is a perfect place for you to visit. Although the rides in this area of DCA do have height requirements, you can take your babies and toddlers to Redwood Creed Challenge trail. Here your kids can run through an outdoor recreational area following clues that Russell and Dug left behind to earn their Wilderness Explorer badges! If there is a ride you want to experience that has a height requirement, talk to a cast member about doing Rider Switch. This allows you to ride a ride while another adult in your party waits with the younger child. When you’re done, you can then switch spots and the other adult can ride without waiting in line again. As you can see, Disney California Adventure has just as much to offer as Disneyland does for everyone in your family! Whether you get a Park Hopper or a 1-Park Per Day ticket, you will have a day packed with fun. Get your discounted tickets and hotel through Get Away Today and use promo code MothersNiche to get an additional $10 off your Southern California vacation package. 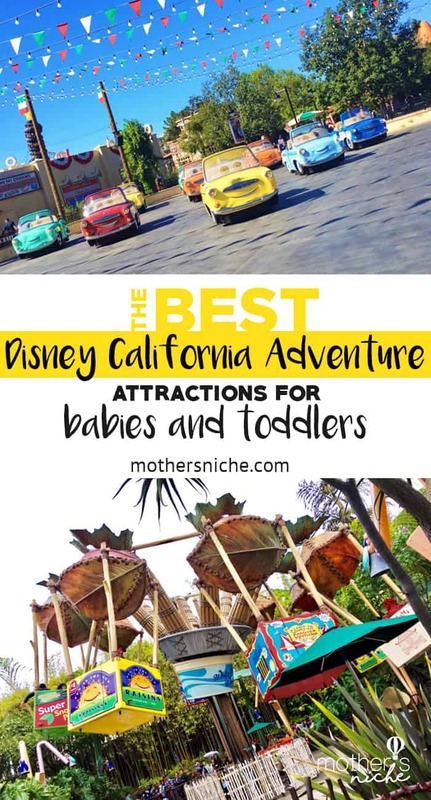 What do YOU think are the Best Disney California Adventure Attractions for Babies and Toddlers? !